Winners & Sinners 3 - Twinkle twinkle lucky stars -DVD - import - Sammo Hung with Jackie Chan and Sammo Hung . Tasked with busting a crime syndicate while trying to save an underworld kingpin from assassins, the world`s most inept crime-fighters, Kidstuff (Sammo), Muscles (Jackie) and Ricky (Yuen), wreak havoc in a holiday paradise with their own peculiar brand of high-kicking justice and outrageous antics. 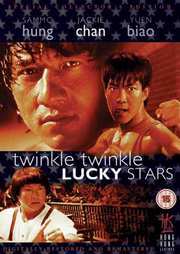 Twinkle Twinkle Lucky Stars resurrects the inimitable slapstick chemistry of the most famous triumvirate in Hong Kong action cinema and showcases some of the greatest fight sequences of their respective and celebrated careers.